The freedom of cruising hawk-like hundreds of feet above is a sensation to be reckoned with. 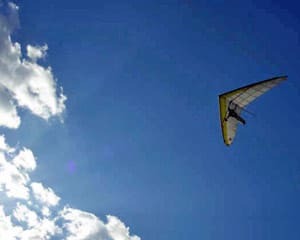 This is hang gliding, a sport both extreme and serene. Nothing comes close! And nothing comes easy—the sport certainly takes a bit of practice. Thankfully this all-inclusive hang gliding lesson grants you access to everything: full use of facilities, both virtual and hands-on training as well as verbal, written and flying tests for Hang 3 flying accreditation. After running through the basics and having a go at the simulator (of which you get unlimited access), you’ll head to the top of the hill to learn how to takeoff. Often the trickiest part for new gliders, this takeoff exercise includes a recording of your descents and unlimited PC use to watch your attempts and break down what went right and wrong. It’s an excellent tool that will move you past this stage with ease. With a full training equipment rental included, the lesson gives you up to 12 months of practicing, ample time to ready you for the real deal. As an added bonus, you’ll also receive camping passes for the premises and use of its facilities including a BBQ and fire pit! This is the be all and end all of hang gliding programs. If you have a serious interest in the sport and want to give it a go solo, look no further than beautiful Ellenville, New York. The Eagle package includes a log book, unlimited simulator use and up to 12 months of training if needed. It also includes all 3 required written tests, 3 verbal tests and all practical flying tests. Use of the big training hill for your H2 flying test, rides up the training hill once you are at that level (weather and conditions permitting) and unlimited PC use to watch and analyze your flying videos. Ever wondered what it feels like to ride the wind? Try Adrenaline Hang Gliding today and you'll know what only the eagles know. A rush of adrenaline that will create a memory guaranteed to stay with you for the rest of your life!